For a fantasy family weekend with nothing but walks on the beach, board games, spa time, and lobster at every meal. 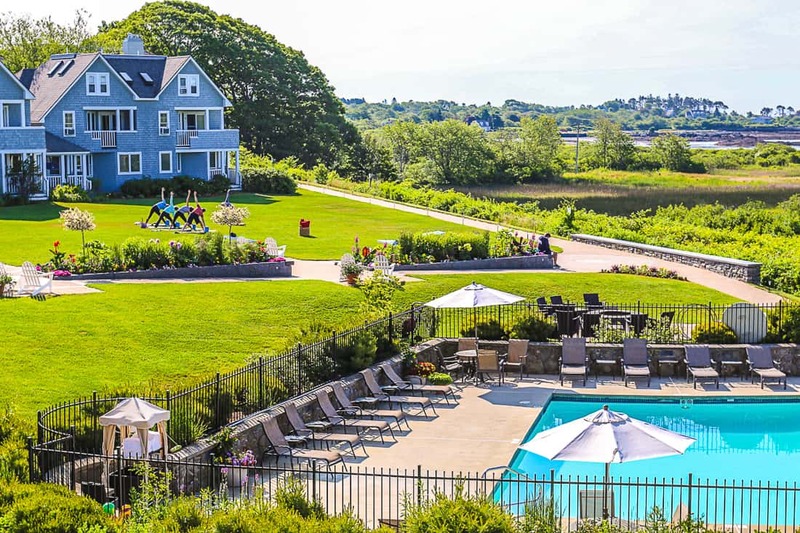 When I think back of all of the places we have explored in New England, I have a very deep soft spot for the Inn by the Sea, just south of Portland, Maine in an area called Cape Elizabeth. I’d never been to Cape Elizabeth, which is a charming community filled with Maine summer residents and Portland commuters. 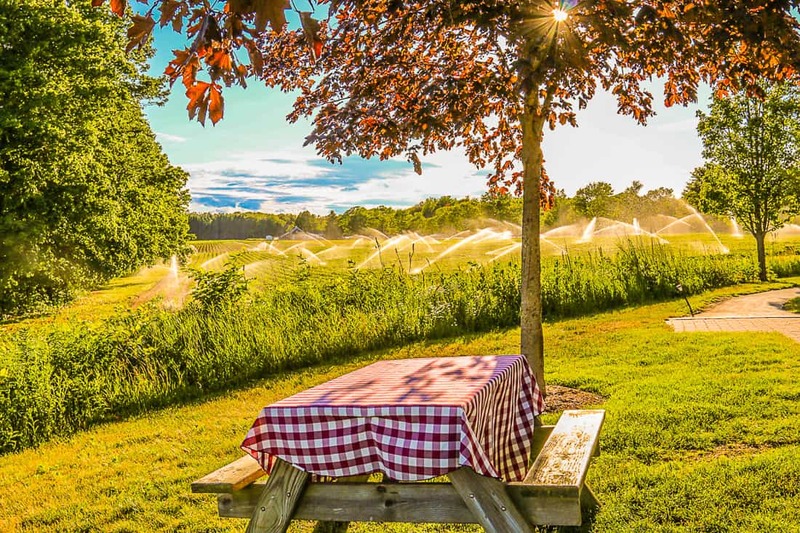 The Inn by the Sea is located next to a strawberry farm that was welcoming its first pick of the season, and its location on Crescent Beach is flawless. 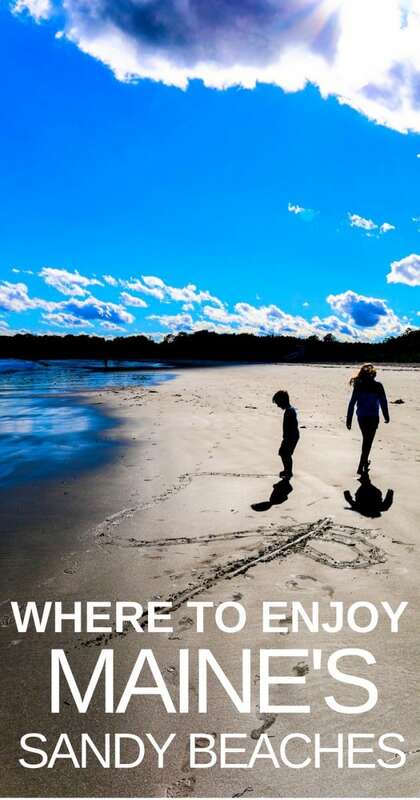 Southern Maine beaches are sandy, not rocky are peaceful, filled with birding opportunities. The inn sits in a u-shape overlooking the Atlantic. For our first visit, I had a quick staycation with my two kids at the end of June the day after school got out. My goal was to kick off summer, slow down and connect with them after those final few meters to the end of the school year finish line that we finally cross—either limping or crawling. I genuinely cherish the ability that travel has to connect us as a family on a deeper level without the distractions of our everyday lives. The Inn by the Sea, a Preferred Hotel, was a perfect destination. I tested my memory of this boutique hotel a second time as my husband and I returned with our kids for a fall break. A true break. I wanted to cleanse from screens, sugar, get more sleep, and slow down after the hectic beginning of a new school year. We found the inn to be as glorious in the fall on our return visit. The resort’s building is a subtle U-shaped structure facing the direction of Crescent Beach. Framed by the building is a great lawn with a heated pool, a fire pit for nightly s’mores and live music, and games like croquet and beanbag tossing. In fine weather, the view from the restaurant’s patio seating is captivating enough to be enjoyed all three meals at the same table. 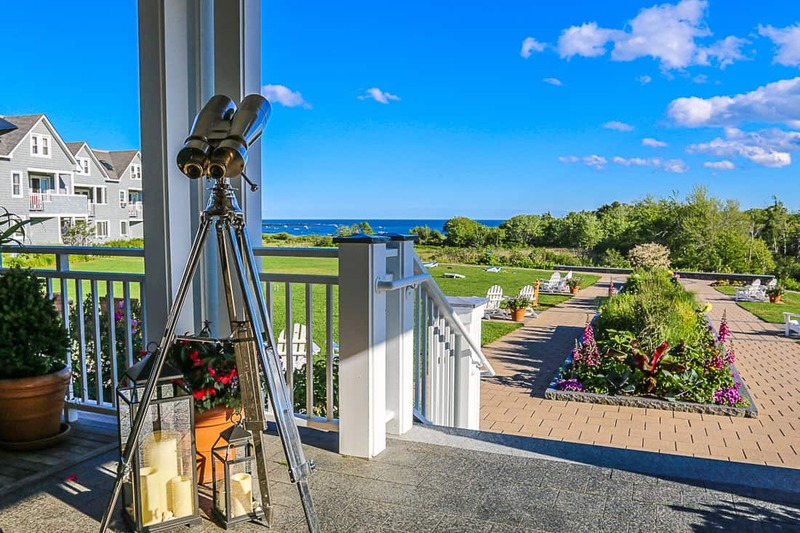 And although the water is seen in the distance, one of the magical treats of the Inn by the Sea is the path that guests take to reach the water. What starts as a boardwalk along a wetlands area becomes a dirt path through a vernal, topiary-like forest. 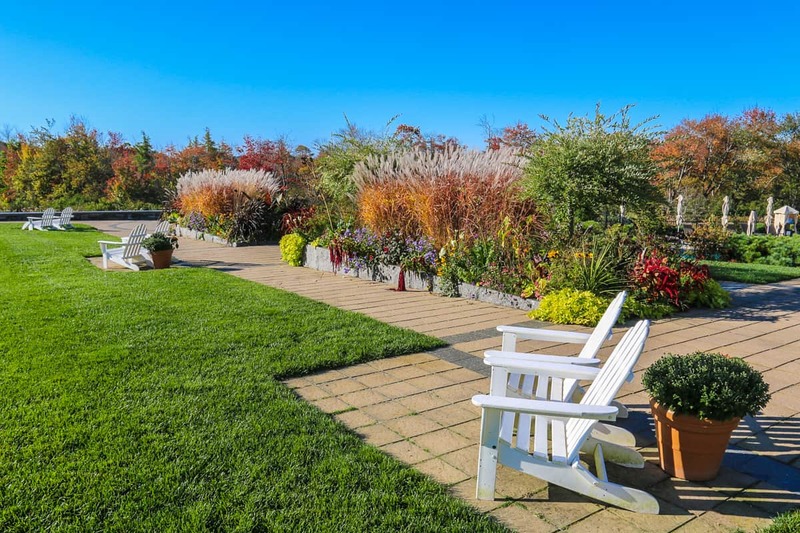 The lawn is bisected by a massive perennial garden that, by fall time, grows tall enough to create a privacy wall. What actually only takes about five minutes creates a magical and transformative experience. With each step, guests’ blood pressure drops, breathing slows down, and senses awaken. Even my children enjoyed this path to the beach almost as much as the beach itself. It is scenery that children’s literary classics are made of. Although my children found the water cold at the very beginning of the summer, it didn’t stop them from playing happily in the sand for hours on end during our weekend. The resort provides children their own birding binoculars, balls, Frisbees, and other games as part of their beach service of chairs and umbrellas. Attendants carry gear for you. There are welcome kits for children that feature sand toys, coloring books, sunglasses, and local treats. We even tried blueberry beer. When in Maine. During July and August, there are special weekly activities for children and families to do like nature hikes, arts and crafts, and family yoga, but there’s not an actual kids’ club. The resort has a babysitting service they can arrange for guests, too, for parents to escape to the spa or have dinner alone. 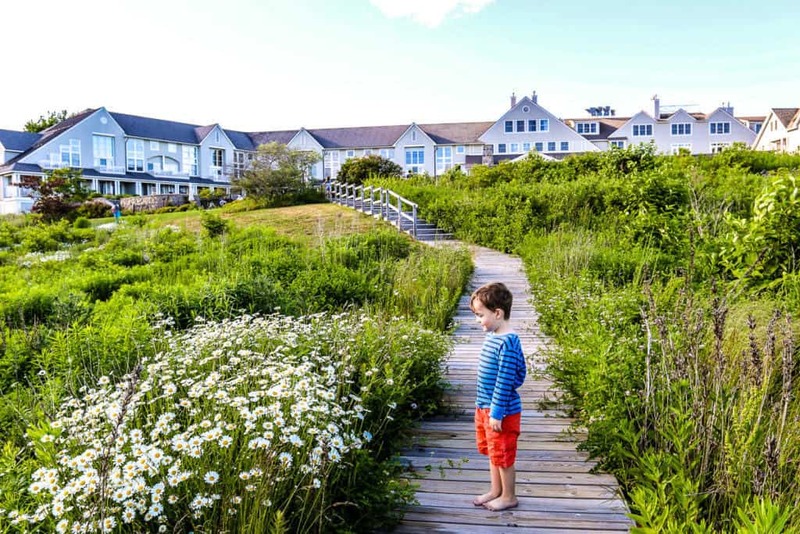 But the families who are seeking to spend real time together will find this hotel just encourages connection in its cozy simplicity. We were so lucky on our first visit to be staying at the hotel on the first strawberry picking at neighboring Maxwell’s Farm at the end of June. It is an incredible unplugged vacation day to have breakfast with ocean views, walk on the beach, pick strawberries, swim, have lunch, swim some more and enjoy s’mores after dinner. The resort has a relationship with the Lucky Catch lobster fishing boat experience. This boat departs from the main docks in downtown Portland which are only about 20 minutes away. After our glorious days at the inn, the sky turned gray, our energy dissipated. I had to rally my kids who were ambivalent about getting up close to fish they thought were creepy. 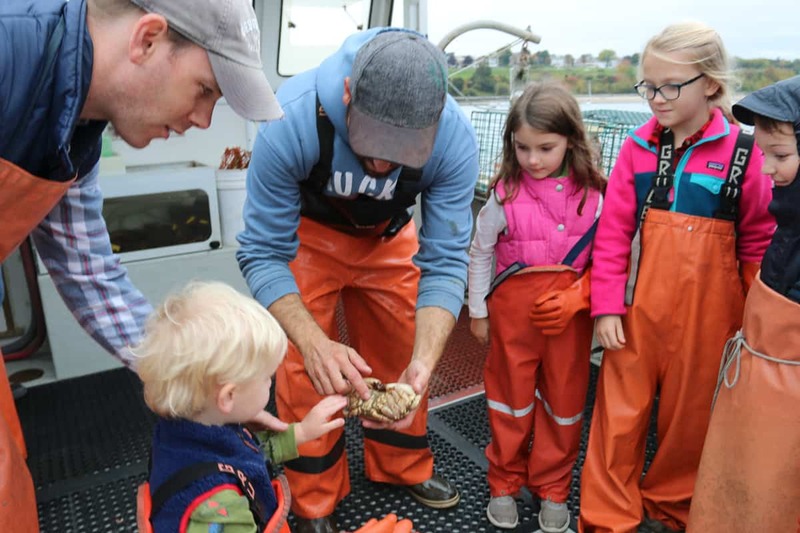 We learned about all the crustaceans that entered the lobster traps before giving them their freedom. We loved every second of the boat ride. 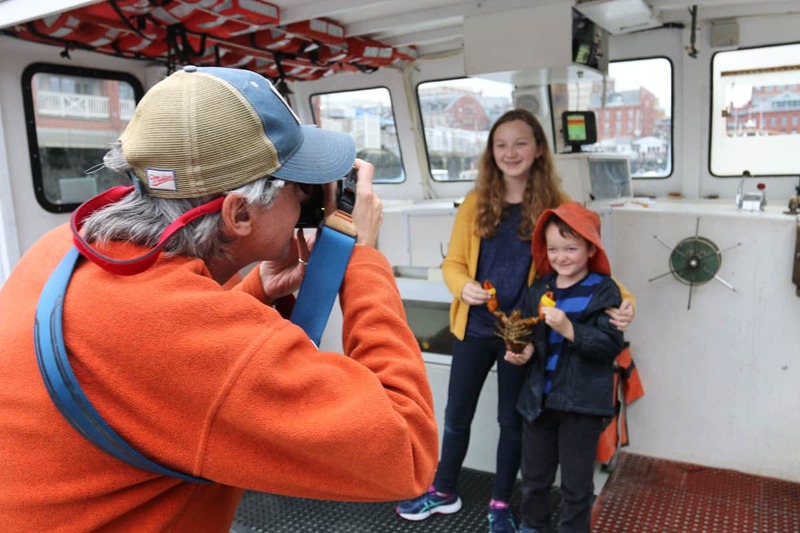 The lobster fisherman had great passion explaining everything from the sites in Portland’s harbor, the area’s marine life, how to bait a lobster trap, and how to trap lobster sustainably. The two-year-old to the 52-year-old was engrossed. We learned to measure them and place the bands on their claws. Families board and pose for a picture they can purchase later. 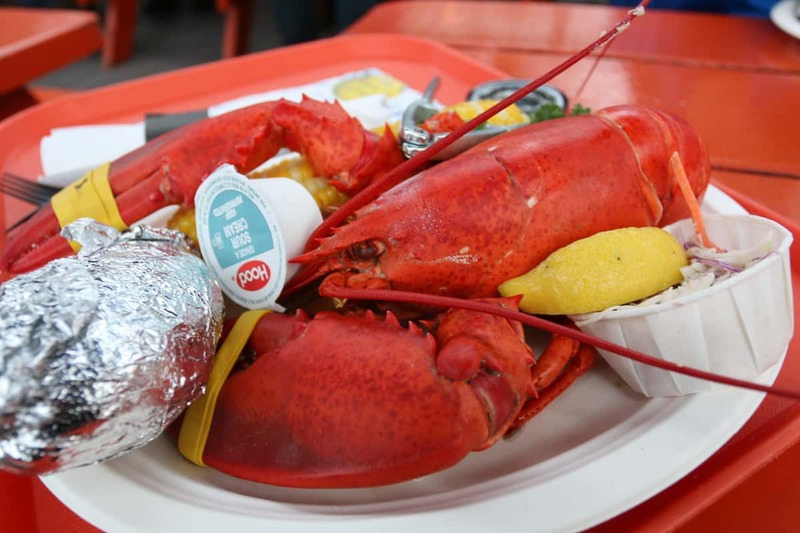 The Lobster Company is adjacent to the dock, and guests can buy their lobster on the boat at wholesale prices and deliver it to the counter at the restaurant for them to steam. This was the most delicious two-pound lobster I have ever enjoyed from our lobster boat excursion. The best hotel for dogs. Period. 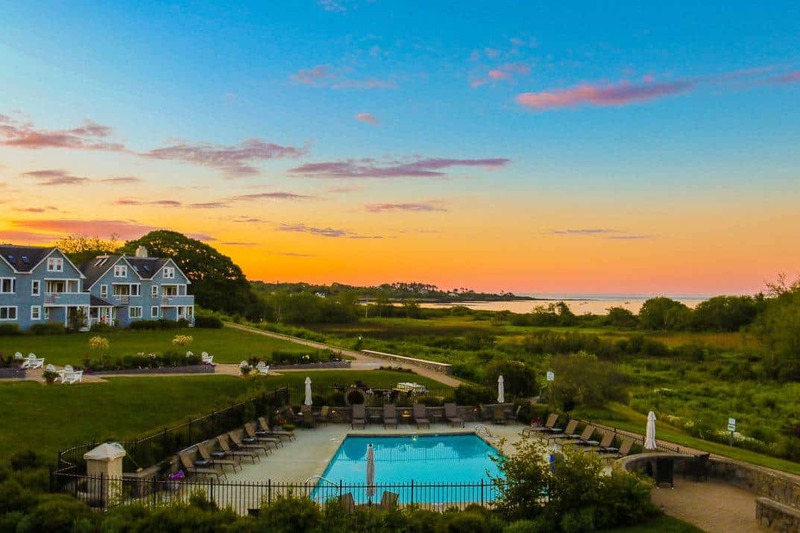 The Inn by the Sea has taken pet-friendly to a different level. Really. This is the best hotel for dogs in the country. What other resort devotes their pool for one week each year just for their canine guests? The Inn is crazy about dogs. If your family has a dog this place may treat your fur baby so well that your kids will get jealous. 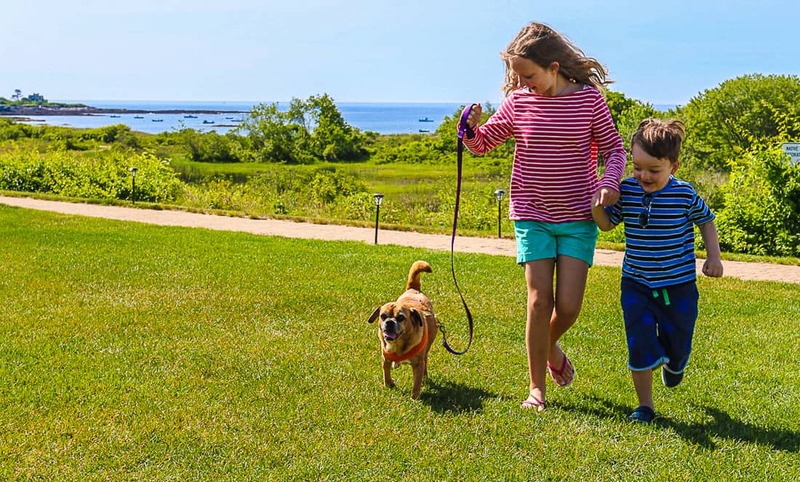 The Inn by the Sea has a wonderful foster program with the Animal Refuge League of Greater Portland who sends dogs to live at the hotel until a guest adopts them. The guest dogs stay behind the front desk in and get walked outside collectively by the staff and guests who ask. Walking the local rescue dog is the highlight for my children. This was Otis. Many guests arrive with one dog and end up leaving with two, or those who live in the area frequently come to Sunday brunch knowing that there is a chance of coming home with the new family member. 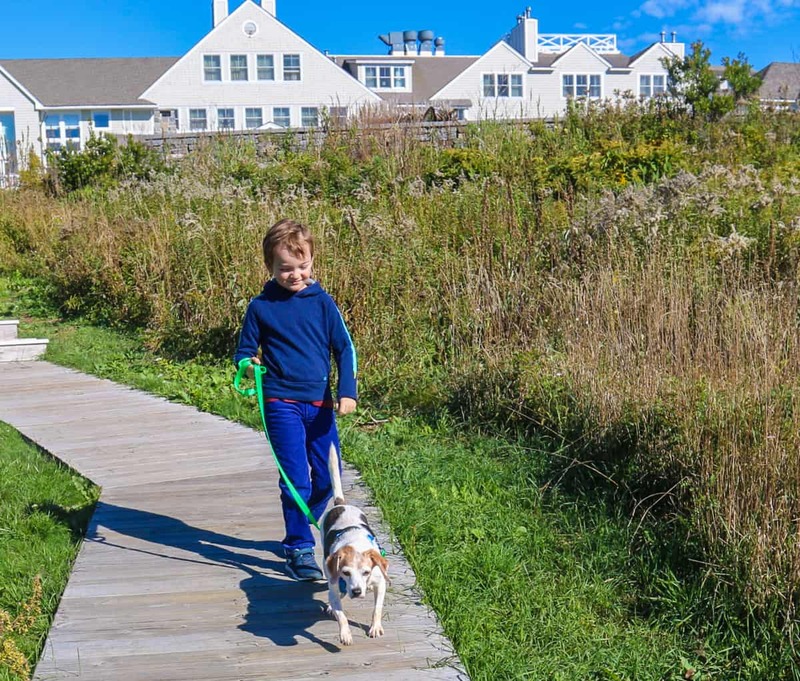 The Inn by the Sea has found nearly 100 homes for shelter dogs in this program. We got to walk Rapunzel only once. We were delighted to hear how quickly she was adopted. If only I could convince the Inn By the Sea to adopt us. 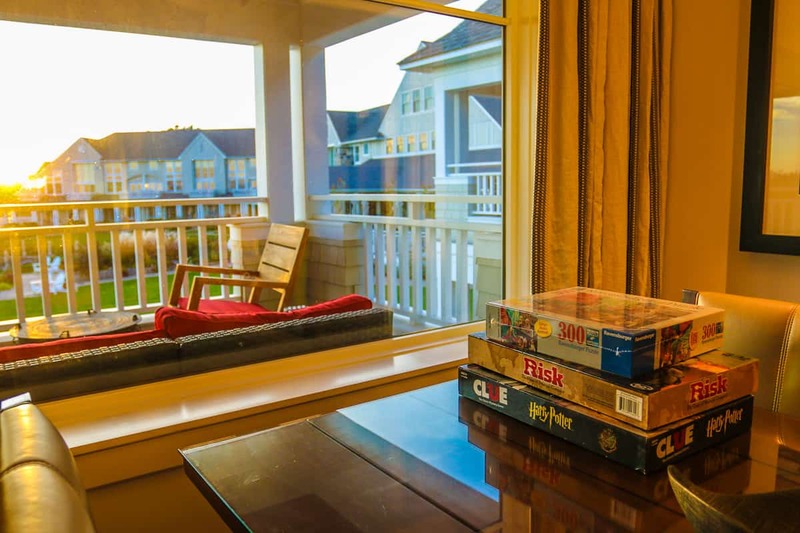 Rooms at the Inn by the Sea are incredibly generous in size with many duplex lofts and suites. There are less than 100 rooms at the resort, so it’s intimate. Families will want to book the Cove or Beach Suites. These two and three bedroom suites offer plenty of space, kitchens with dining and living areas, but no washers and dryers. The master bedroom in our Cove Suite. Our Cove Suite was fabulous. It contained a King master bedroom with the best bed my husband and I have ever slept on. Given how many nights we sleep in luxury hotels, this is saying something. (It was a Simmons Beautyrest Recharge). The second bedroom had two queen beds and the large bathroom separated them. The living, dining, and kitchen area were charming, with stocked shelves of games and stylish design accessories. There was a wonderful gas fireplace and a furnished deck, too. The touches that you know you are in Maine are twofold: the “Do Not Disturb” lobster guests hang on the door and that the otherwise fully stocked kitchen flatware drawer offers forks and lobster crackers—nothing else. We cocooned in our room after some beach walking for the Saturday enjoying a family game of Risk. My husband and I agreed it was the most relaxing and joyous time we had spent together on a vacation. Reconnect in the family suites like we did. Our screen free weekend was just what we needed. On our last trip, we had one of the spa suites, a two-story loft with a master that overlooked the living room below that came with a sleeper sofa. The scale of the bathroom inspired my children to want to play “day spa” so they set up a multi-sensory experience for me, sending me downstairs as my daughter prepped the bedroom and bathroom with soft music, low lights as they both squeezed every ounce of the hotel’s lotion sample on my feet and ankles. Their desire to pamper me was moving and so sweet. I credit the Inn by the Sea for putting me in such a delightful mood that my children thought I deserved such special loving care. And while my four-year-old had yet to show any promise a reflexologist, I found his, “Mama, how did you like your treatment?” question to be one of my favorite summer memories from the trip. 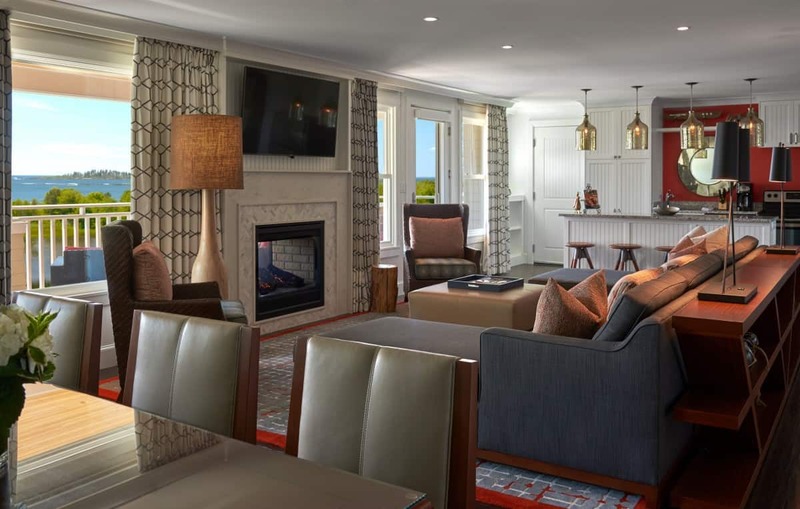 The inn opened their newest building of large, beach-facing suites with two and an option for three bedrooms. These suites have two bath bathrooms and larger living areas with fireplaces. 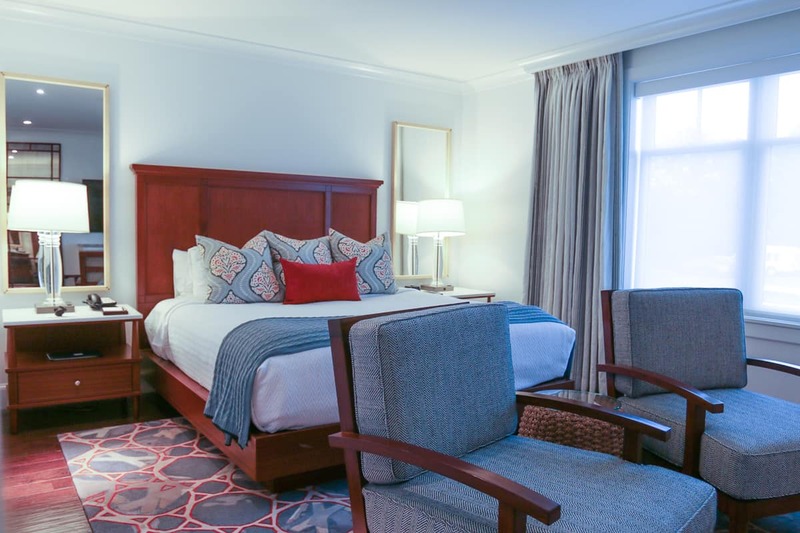 Larger in scale than the Cove Suites, the Beach Suites are the premier choice at the inn. The on-site restaurant, Sea Glass, is a foodie destination in the area for a reason. Our meals were wonderful showcasing many local ingredients strawberries, tomatoes, and —of course—lobster. I made it my mission to consume as many berries and lobster on my weekend. The lobster scramble with wilted spinach and hollandaise on grilled sourdough was worth having both mornings. We shared the new blueberry French toast bread pudding that was outstanding. My children were always able to find healthy choices they liked, too. Yoga classes are available out on the lawn many summer mornings, and I confess I enjoyed watching their sun salutations from my balcony in my robe with coffee in hand. The Inn by the Sea has a spa on his bottom floor that offers excellent massages facials, and an adjacent fitness studio. The spa specializes in 90-minute ocean inspired treatments using products with sea ingredients. The gym facility is small but outfitted with a state of the art on demand video training system. Although we were guests of the Inn by the Sea, these opinions are entirely my own. As always your photos are beautiful and really capture what a special place this is! 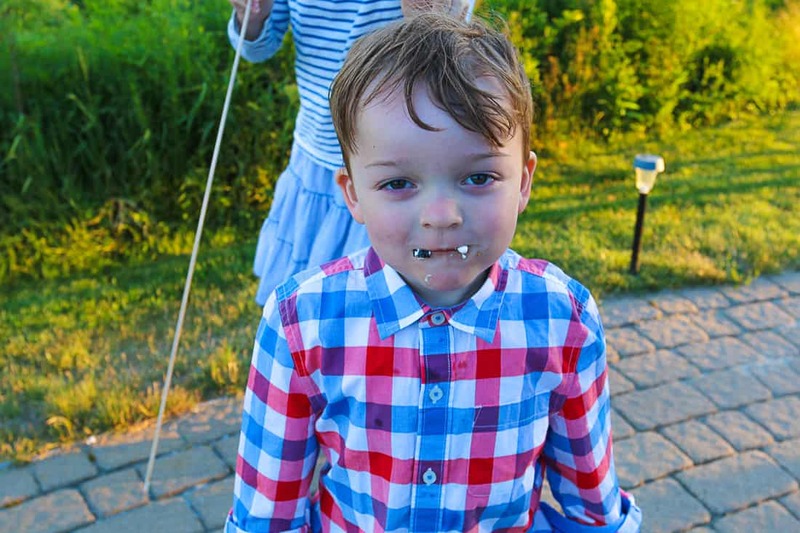 I think we would have to time our visit for strawberry=picking season too as my eldest LOVES strawberries (seriously, I think he’s eaten them every day of his nearly nine years on earth!). Sounds like a magical hotel in a stunning part of the world. Thank you, Katya, for the kind photo words! I hope you get to pick strawberries in Maine on day! 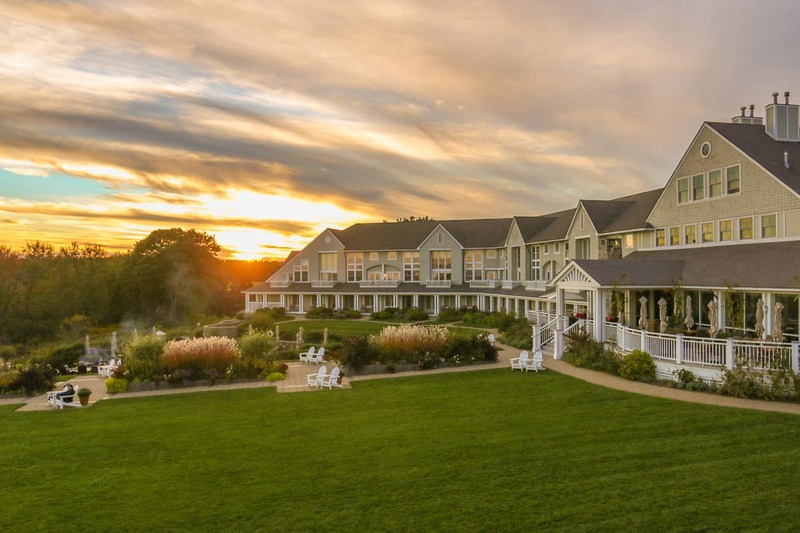 I adore a good resort by the sea and it doesn’t get much better than one in New England. 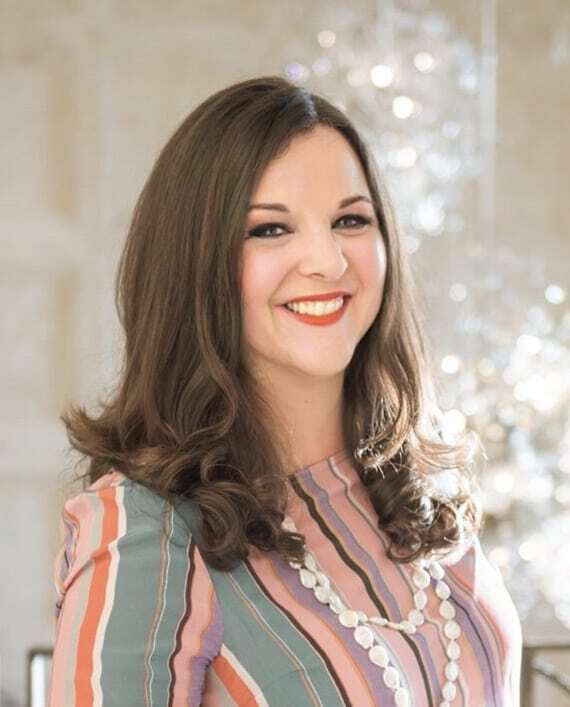 Robin, so happy to read about your amazing experience. We are planning our first trip to Maine next summer and will plan to check this beautiful place out for ourselves! Very lovely Inn! Looks very relaxing and I so get it about the path to the sea!!! I just experienced something similar in Martha Vineyard. You totally need this path to get transformed- it is like a destination in itself! Oh I agree and wonder where your path on the vineyard was. I hope to see that path at different seasons now, so experience the journey in its different stages. 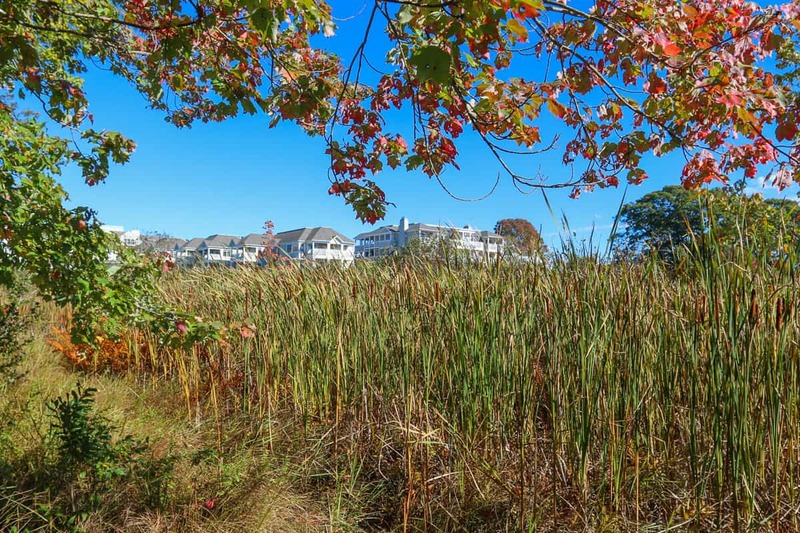 WOW……..amazing photos and presentation of a wonderful New England resort. Thank you! Huge thanks for the tip on trying this place! My husband and I had a WONDERFUL visit, and highly recommend it for a romantic getaway.